The above words from Joker in the movie ‘Dark Knight’ best summarize the effect Alice in Wonderland had on me when I read it the first time at the age of 12. I was stressed out from studying for my annual exams and was looking for a light children’s fantasy to de-stress. Having seen bits and pieces of Alice in Wonderland on TV and from the cover illustrations, it seemed exactly what I was looking for. But it turned out to be an experience akin to that of the beggar shivering in cold who was delighted to see a blanket floating in the water. The beggar jumped into the water gleefully. But before he can grab the blanket, the blanket grabs him for it turns out to be not a blanket but a big bad bear. The book threw me into depression for 3 whole days. None of the elements in the story by themselves are scary. But all put together creates a surreal horror of living through a nightmare. Everything is so unpredictable and illogical that one gets a feeling of not only living among lunatics in a mental asylum but of oneself being one too. The story has no plot, no plan, no direction. Things just keep happening. The characters are all shallow, self centered and dehumanized. Most of the fantasy elements have an element of unpleasantness packed into them- the pool of tears for instance. Alice is nothing like the typical sweet and innocent female protagonist of most children’s novels. She is more like a feminine and younger version of Holden Caulfield in J D Salinger’s Catcher in the rye – of a dry and sarcastic temperament. One can find humor in the ridiculousness of the whole thing but the humor is definitely of the darker kind. Not something one would typically look for in a children’s fantasy. Going by what has been said so far, one might wonder why at all have the books been popular and that too over time. Of course the easiest explanation would be that this kind of darker fiction has its own following. But the aspect that really sets it apart and makes it appealing to all kinds of readers is the clever, quirky and though provoking conversations and quotes. The conversation between Alice and the Cheshire cat is a classic example. 'Then it doesn’t matter which way you go,' said the Cat. There are many such gems sprinkled generously all over the book. The Alice series – consisting of ‘Alice in Wonderland’and ‘Through the Looking Glass’ is definitely not a ‘feel good’ fiction. However the elements of satire and allegories can provide a intellectual simulating experience. 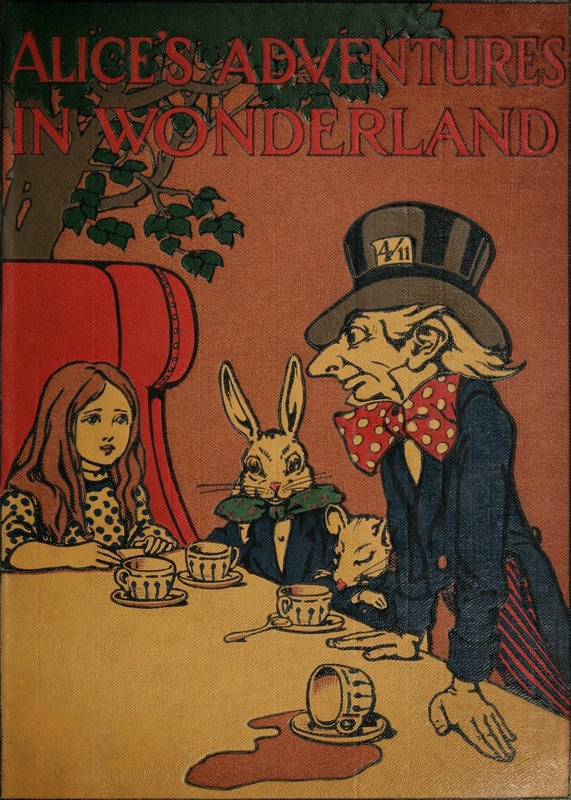 Brilliant little RE-view of Alice in Wonderland. IT's true though, there have many times that I felt the story didn't have any direction, but the "dark" elements were aplenty. Maybe that's what made it famous. Thanks Sid. Good to know you agree with my unconventional views on the book. And thanks for visiting. Glad I could make you see the story in a new light, Renu. True. Some books do give you a different perspective depending on what point of life you read it in. That is a thought-provoking analogy you have invoked. I remembered reading it too rather early and being equally stumped, maybe worse. I read Gulliver's Travels too, roughly at the same time. It wan only much later that I learnt that these books were meant to satires and allegories. Sometimes we decide something is a children's book just by the theme. Animal Farm is another classical example of a book some people assume to be children's literature. Yup - Satires and allegories they are. Meant to disturb and make you think about the world you live in. But when you don't know it is supposed to do that, you are caught off guard.